We have a window over the sink in our kitchen, where I can look out of it to our back yard to admire the birds and the beautiful flowers. Missouri has had a lot of rain lately, giving our home-grown tomatoes just the right amount of drink they have needed to thrive. I hadn’t gone outside for awhile because I was busy working at home. Then one day as I started washing the dishes, I looked out the window and saw a row of beautiful, pink flowers with long, bright green stems. I wasn’t sure what kind of flowers they were until I asked my friend Theresa today. 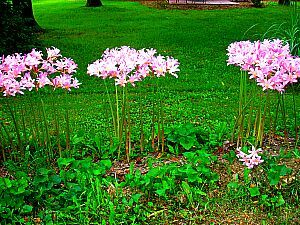 She said they are called surprise lilies and they spring up almost overnight in the summer. Sometimes it seems as if nothing may be happening in our lives, when God is actually doing a deep work in our hearts underneath the surface, and then suddenly things start moving. We begin to see breakthroughs and answers to prayers that we have prayed about for years. It’s hard and can be frustrating to be patient during the waiting period, but if we will just trust the Lord, He has perfect timing for everything. 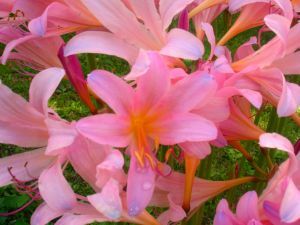 And He has surprises in store for you and me – like the surprise lilies. What is that you are waiting for in your life? What is your prayer that you’ve been requesting for some time now?